Do you have Pics of yours? I don't have a pic, but mine looks something like yours except it is round like a little planet or something. I tried to throw it out but my husband retrieved it out of the garbage. Those pesky Colorado squirrels climbed down the chain, chewed through the fastening at the top, which made the whole thing come tumbling down, then they gleefully got to the the seed with their little paws. North Florida squirrels seem to be much smaller and less aggressive. I think even just my little kitty might keep them at bay. I don't have a picture. Squirrels have ruined many of my feeders, the 'Fox Squirrels don't seem to do any damage, however the grey squirrels are constantly trying their best to get at the food. We have feeders in our back yard hanging from a wire stretched between two trees. Darn if these 'bushy tailed rats' don't climb up the trees and onto the wire! Have watched them do this. They have chewed through, climbed into, hung from, just about every type of feeder that I have used. At night time even a few raccoons have done the same. Trapped them and took them a few miles from here and released them into the woods. I tried not to mind the squirrels aggressiveness at first, but after having to replace a few demolished feeders they are on my 'not most wanted' list. I have even watched the grey varmints leap from the ground about 4 feet to the bottom of some feeders and hang on, then crawl up to the feed. I use mostly sunflower seeds in most of the feeders and safflower seeds in one. Squirrels don't seem to care for those seeds. safflower seeds in one. Squirrels don't seem to care for those seeds. Yes, for years and years, all I fed was safflower because the squirrels really don't care for it. Then my feed store quit carrying it. They would probably go for the feeder no matter what. I think those wily little rodents just enjoy the challenge of it all. cil: you are so right...I have observed the furry fellows sit on a lower tree limb watching and waiting for me to finish filling the feeders, then climb down and hop/walk over and sit up under the feeders and I guess, measure he distance. Sometimes while on the limb, they will even 'bark' at me. hjlacey: Yep, that is exactly what I am referring to. Sit there and try to look so innocent, when all they are waiting for is me to move out of their way. Sometimes I think I would love to get the Yankee Flipper just for the entertainment value. (Check out the video, it's linked on the page. Good for a few laughs.) However, it's pretty expensive, and I'm sure they'd find a way to get into it. I used to battle the squirrels constantly, until I started using safflower seeds. As someone upthread stated, they don't like it, so they leave the feeders alone. Do you have a Lowes Home Improvement center near you? That's where I've purchased mine. They also sell it at Wild Birds Unlimited. At first I balked at the price of safflower vs sunflower, but after I started using it, I realized I'm actually saving money, because it's not being eaten as quickly. I do love the squirrels, though, so I feed them, too. 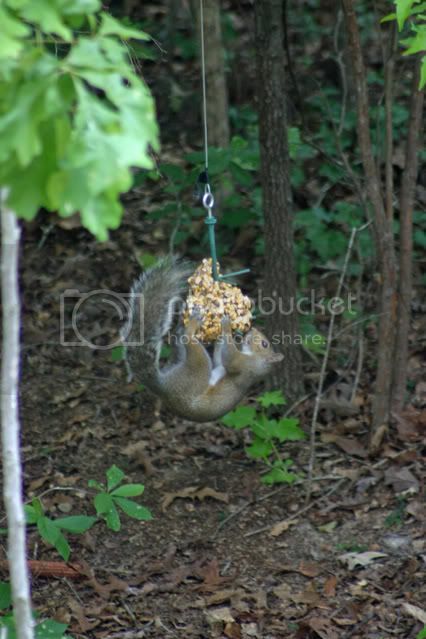 A squirrel bungee is particularly entertaining. oooooh...I love it!! where did you get it? Thanks, Claire, we do have a Lowes. I will check out the seed situation. I was still back in Colorado when I was feeding the squirrels--oops I mean birds. We are now here in NE Florida and still settling in, but I hope to get some feeders going this fall, with or without squirrel interaction. We got ours at Lowes. You can find them online, but once you consider shipping, Lowes is usually cheaper. The bungee with one corn block was about $8, and refills run about $3. You can also put dried corn cobs on it, but they tend to go through it faster. The funny part is, it's so light with the corn cobs that the squirrels pull it up from the branch, then try to run off with it. Hilarity ensues when they get to the end of the line, and are flung backwards. The blocks are much heavier, and last longer. Also, if you can find a place to hang it that is not too easy for them to get at it, it's really fun to watch them figure out how to do it. Usually it involves jumping onto it, then hanging on while it swings back and forth. The birds also try to eat at it, but don't get very far. It's fun to watch them land on it and peck away, though.